The running game needs to get going. 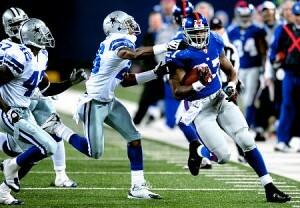 Ahmad Bradshaw should be back, which will help, but it starts with Brandon Jacobs. Give him more carries. Give him a chance to make something happen. I’m not concerned about the passing game–especially because Eli and the receivers were on fire when they last played Dallas. Passing game will be fine. A balanced attack gives them a much better chance to win. Another key is containing DeMarcus Ware. While he hasn’t been his normal self this year, he’s still a threat, and he’s still dangerous. Special attention will have to be given to him. Well, Coughlin sure shook things up. Benched Osi, Robbins and Blackburn. Started Kiwanuka, Canty and Goff. Will these changes provide a spark? I don’t know. I do know that this will sure motivate Osi, Robbins, Blackburn. The Giants have to get a pass rush going. Have to fluster Romo. Corey Webster needs to stop Miles Austin. With Michael Johnson unlikely to play, we’ll see a lot of Aaron Ross at safety. The starters at safety, however, will be CC Brown and Aaron Rouse. Gulp. That’s why Webster needs to stop the number one threat for the Cowboys. Stop him, and you don’t need to rely on the safeties as much. The Cowboys haven’t been as drama filled this year. But, they are showing signs of their normal December slide. Squeaked a win out against Washington. Lost to Green Bay. Lots of people worried in Dallas. Will they have another disappointing December? Or will they rise to the occasion? Tough to answer. They do have a three headed running attack–Marion Barber, Tashard Choice, Felix Jones–that gives defenses fits. Tony Romo is always dangerous. Jay Ratliff is the best player no one has heard of. This is a good team. We’ll see how mentally tough they are. Check out our friends over at CowboysGab for the latest on the ‘Boys.